Combine the shrimp, the lemon zest, the garlic, the sea salt, the crushed red pepper flakes, and the black pepper in a bowl. Mix well. Let the shrimp and the herbs marinate in the refrigerator for at least a half hour. Add the canola oil to a 12-14 inch non-stick skillet and put the pan on medium high heat. Add the shrimp. Cook while stirring for four minutes. 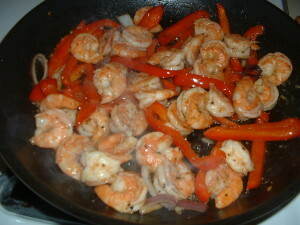 Add the red bell pepper and the red onion. Continue to cook while stirring for three minutes or until the vegetables become soft. Mix the corn starch and the lemon juice. Add the lemon juice and the corn starch to the shrimp and the vegetables in the pan. Turn the heat down to low. Cook while stirring for one more minute. Turn off the heat. Add more sea salt and/or pepper, to taste. 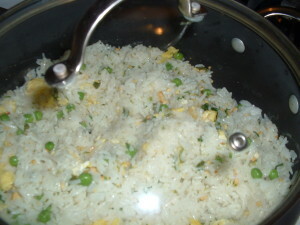 Serve with cooked rice. In a large oven proof pot with a lid, combine the canola oil, the sesame oil, the ginger, the jalapeno pepper, the garlic, the scallion and the sea salt. Cook while stirring on medium high heat for two minutes. Add the rice. Continue to cook while stirring for one minute making sure that all of the rice grains get coated with the oil. Add the coconut milk and the water. Stir one more time. When the liquid comes to a boil, cover the pot and place it into the pre-heated oven. Bake for thirty minutes or until the rice absorbs all of the liquid. Add the peas, the peanuts, the scrambled egg, and the cilantro. Mix well. Put the lid back on and let the rice sit for five minutes before serving.. Trim the end of each aparagus spear by cutting one inch off of the bottom. Using a vegetable peeler, shave off the outer layer of skin on each spear to a point about one inch from the bottom. In a pot of salted boiling water, cook the asparagus spears for three minutes. Remove the asparagus from the pot and drain in a colander. Put a non-stick skillet on high heat for three minutes. Add the olive oil, the thyme stalks, and the mushroom slices to the pan. Cook without touching for four minutes. If the mushrooms absorb all of the oilve oil, add a little more of the oil to the pan. After four minutes, turn the mushrooms and cook without touching for three more minutes. Turn off the heat. Remove and discard the thyme stalks. Stir in the shallot, the garlic, the sea salt, and the black pepper. Preheat the oven to 450 degrees. Brush the top of the pizza crust with a tablespoon of olive oil. 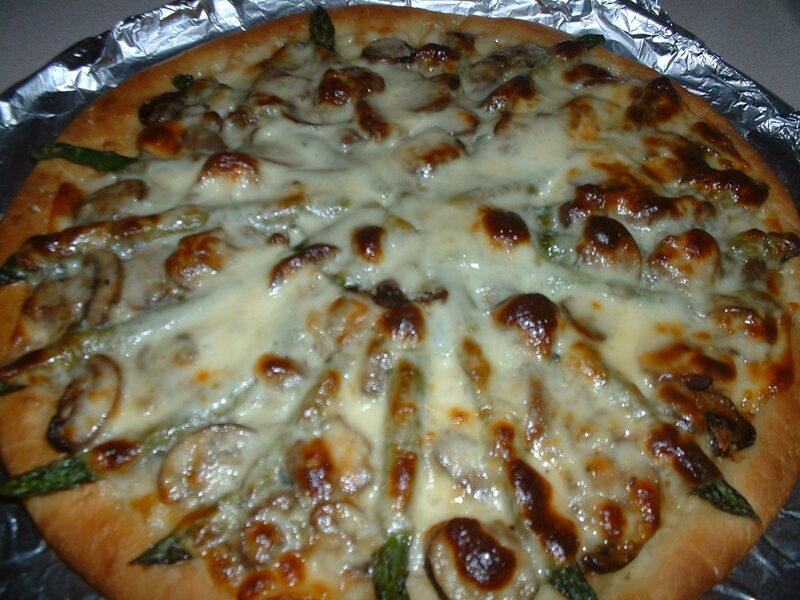 Arrange the asparagus spears like spokes on a wheel on top of the pizza crust. Place the sauteed mushrooms evenly in between each asparagus spear. Sprinkle the asparagus and the mushrooms evenly with the grated parmesan. Top the vegetables with the mozzarella cheese slices. Bake in the preheated oven for 15 minutes until the cheese melts and becomes bubbly. Let the pizza cool for ten minutes before slicing. Instead of frying calamari, I prefer to grill it. Grilling produces a hint of smoky char flavor to the already delicious briny, slightly sweet flavor of the squid. Pat the calamari tubes dry with a paper towel. Toss the squid in a bowl with 1/2 of the olive oil, 1/2 of the sea salt, 1/2 of the crushed red pepper flakes, and the garlic powder. Set aside. 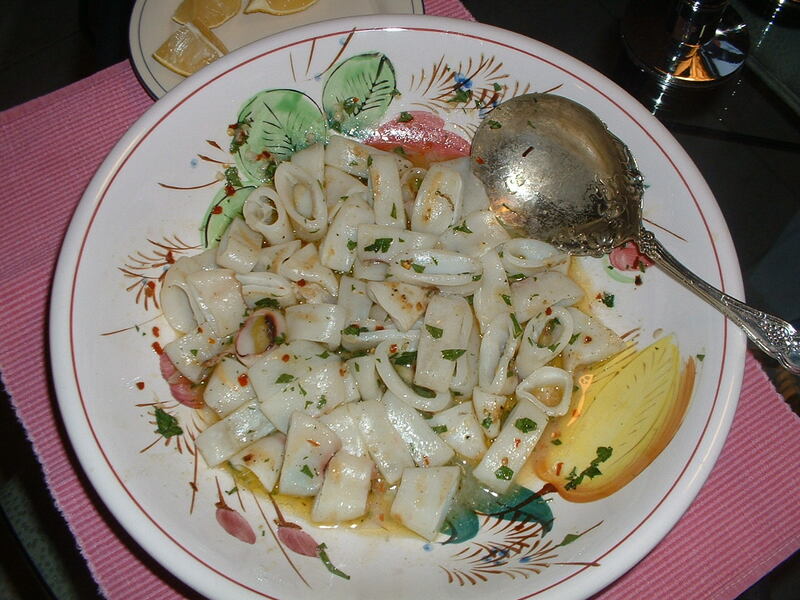 Combine the minced garlic clove, 1/2 of the olive oil, 1/2 of the sea salt, 1/2 of the crushed red pepper flakes, and the lemon juice in a salad bowl large enough to hold all of the squid. Whisk until well blended. Set aside. Place the calamari tubes on a hot gas or charcoal grill. Cook for three minutes on each side turning only once. Cut the cooked calamari into circles about 1/2 inch wide. While the squid is still warm, toss it in the olive oil and lemon dressing. Add the chopped parsley. Mix well. You can add more crushed red pepper flakes at this point, if you like spicy food. Serve at room temperature with additional lemon wedges. Put the beaten egg and the water in one shallow dish. Mix well. Put the flour in one shallow dish. Put the breadcrumbs in one shallow dish. Add 1/4 teaspoon of sea salt and an equal amount of ground pepper to each component. Take a zucchini slice and dip it into the flour shaking off the excess. Next dip the zucchini slice into the egg and water mixture. Finally, roll the zucchini slice in the breadcrumbs. Put the breaded zucchini slice on a wire mesh rack. Repeat the process until all of the zucchini slices are coated with the flour, the egg, and the breadcrumbs. For best results, refrigerate for at least one hour. Put the olive oil in a non-stick skillet and put it on high heat for four minutes. Start frying the zucchini in batches being careful not to overcrowd the pan. Let the fried zucchini drain on a plate lined with a paper towel. Sprinkle with sea salt when you take them out of the frying pan. You may need to add more olive oil to the pan as you go. 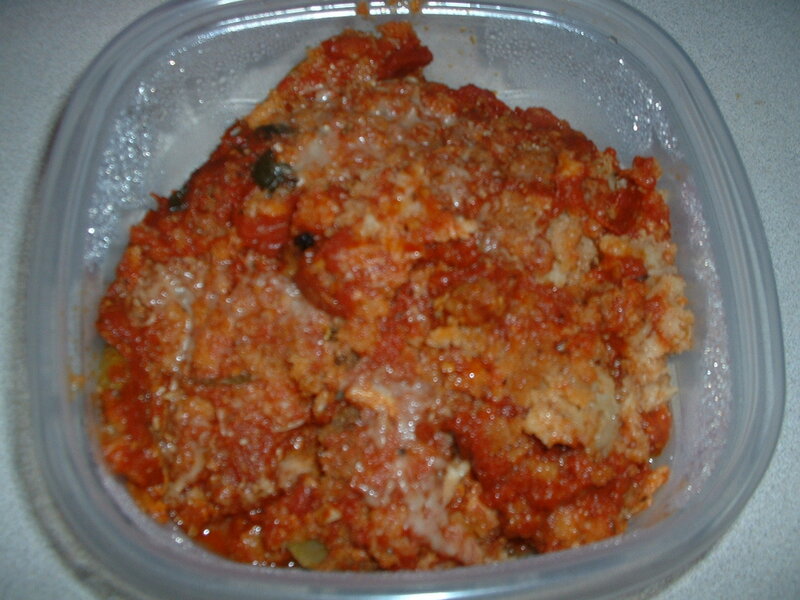 Put a third of the tomato sauce on the bottom of a baking dish and spread it around. Add 1/2 of the fried zucchini on top of the sauce. Spread a third of the sauce on top of the zucchini. Sprinkle half of the grated cheese on top of the zucchini and the tomato sauce. Finally, place the rest of the zucchini on top of the first layer. Add the rest of the tomato sauce and sprinkle the top with the balance of the grated cheese. Cover with aluminum foil and bake in the preheated oven for 45 minutes. Let it sit at room temperature before cutting and serving.